Nearly half of listed mining companies are in the red. SA’s mining industry’s real GDP is smaller than it was in 1994. The financial services industry, in contrast, has grown its GDP nearly 170% over the same period. The Minerals Council of SA recently reported that barely a quarter of gold mines are making profits under current conditions. Looking at the return on capital employed for the mining sector for the latest available reporting periods, roughly half of the listed mining companies are in the red. Even more troubling is that over a five-year period the picture is virtually unchanged, with 14 of the 31 reporting companies showing a negative average return on capital. Platinum and gold, once the bedrock of the South African economy, have become virtually irrelevant, though for different reasons. Both are affected by deteriorating metal prices, and face the same headwinds: above-inflation wage increases, high electricity prices, and a dysfunctional and hostile mining regime, all of which are reflected in the lack of investment in recent years. There is a sense that gold mining is stumbling into its sunset years. Former Harmony CEO Bernard Swanepoel says SA’s gold mining sector has possibly 30 years of life in it, though it could be a great 30 years. Mines are deeper and more expensive to work, with labour now accounting for more than half of costs. Many are looking to technological solutions to bring down costs by a percent or two. SA platinum mines face competition from Zimbabwean and Russian producers, while global demand is being squeezed by a shift away from diesel to cleaner-burning petrol and electric engines. The growth in recycled platinum also weighs on the demand for platinum group metals (PGMs). Read: Is there a future for platinum? The overall picture for mining may be gloomy, but this is not to say there weren’t some excellent investment opportunities in the sector. As the accompanying table shows, the best return on capital over a five year period came from Wescoal and Assore, with averages of between 17% and 20% a year. Assore’s share price is up nearly five-fold since early 2016. Wescoal’s share price is 150% up over the same period. Exxaro is up three-fold. Even DRDGold has doubled in price since early 2016. ARM is up 200%. That’s if you got the timing right. 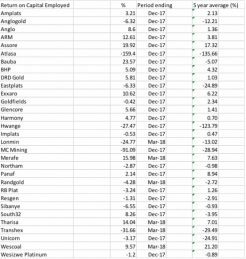 For buy-and-hold investors, mining has been a disaster over five years: only a third of mining shares made any gain whatsoever over this period. The best was Merafe Resources with a gain of nearly 90% over five years, which is equivalent to the average gain in banking shares, as measured by the JSE Banks Index. That’s the beauty of mining from an investor’s point of view, and why it continues to attract interest so long as there is the prospect of hauling ore out of the ground at a profit. 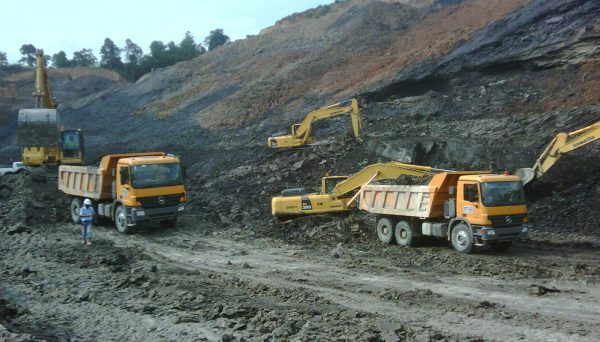 Mining profits are highly geared to commodity prices and the general operating environment. A 10% improvement in commodity prices dramatically alters the mining outlook, particularly for those currently operating at a loss. But there’s also the danger: the market cap for Implats and Lonmin, both platinum producers, has halved since the start of the year. Lonmin, with a market cap of less than R3 billion, is a shadow of the mining titan it once was. Looking at the table below, it is difficult to see how some of these companies can continue to erode shareholders’ capital for much longer without radical surgery. That generally involves shutting down loss-making operations and switching to more profitable ones. A Minerals Council survey of 16 companies representing a cross-section of commodities suggests a total of R145 billion will be spent on capex in the next four years, but this could rise to R267 billion given a more conducive investment environment. Mining needs this investment to improve its profitability profile. The regulator is seen as hostile to the sector, and the legislative environment is uncertain and subject to arbitrary change. One example of this is the unilaterally developed Mining Charter and its BEE ownership requirements, which has faced stiff resistance from the sector. There has been a more cooperative approach in recent months, according to Henk Langenhoven, Minerals Council chief economist, and a better understanding among regulators of the challenges that have to be overcome to breathe fresh life into a moribund sector. That is the first necessary step in salvaging what looks like as hopeless business case.